Two years ago, Pulitzer Prize winner Chris Hedges and award-winning cartoonist and journalist Joe Sacco set out to take a look at the sacrifice zones, those areas in America that have been offered up for exploitation in the name of profit, progress, and technological advancement. They wanted to show in words and drawings what life looks like in places where the marketplace rules without constraints, where human beings and the natural world are used and then discarded to maximize profit. 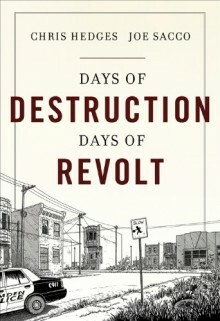 Days of Destruction, Days of Revolt is the searing account of their travels.The book starts in the western plains, where Native Americans were sacrificed in the giddy race for land and empire. It moves to the old manufacturing centers and coal fields that fueled the industrial revolution, but now lie depleted and in decay. It follows the steady downward spiral of American labor into the nation's produce fields and ends in Zuccotti Park where a new generation revolts against a corporate state that has handed to the young an economic, political, cultural and environmental catastrophe. A searing, angry indictment of contemporary economic injustice and social ills passionately told through Hedge's prose and Sacco's graphics.